Andy Weir, author of The Martian, which became a box office hit movie starring Matt Damon, published his second book Artemis, a story set on the Moon. Andy Weir’s style of hard science fiction is factually accurate to the laws of physics and extremely detail oriented. In this episode we’ll examine his vision of the first lunar community. If you haven’t read the book Artemis by Andy Weir yet, I highly recommend you do. The witty humour and technical depth of his writing has made his books among my favourites, and were a driving factor in getting me to read more fiction. But a Word of warning, there may be some spoilers in this episode. The setting of the book is the city of Artemis, the first human city, not on earth, but the moon. Andy went to great detail doing research on how such a city would come to be, what the buildings looks like, what the culture would evolve into, how the economy would work in minute detail. It is all very believable aside from a couple of minor things to help with the plot. The city itself is situated 40km from the Apollo 11 landing site, which has turned into a tourist attraction and the main economic driver of the city. Tourists can arrive at Artemis, where they can experience lunar gravity, and enjoy the fine hotels, and food expected at such an exotic and expensive location. A 40km train ride will take tourists to the Apollo 11 Visitor Center where the original footprints are preserved and people can experience a moon walk within an inflatable ‘hamster wheel’ device. Much of the base is dedicated to the tourism market, and catering to it. Space tourism has long been foreseen as a driver for for human space travel. From various plans of orbiting space hotels, to the current cusp of space tourism becoming real with Virgin Galactic, and Blue Origin targeting commercial tourist flights in early 2019. 600 people have already paid the deposit to fly on Virgin’s SpaceshipTwo, which for context, is more than the total of all people that have ever been to space in history. As a basis to support a lunar city economy, tourism certainly could be a main export. The city of Artemis itself is a collection of 5 domes on the surface of the moon, connected by short passageways with a smaller dome at the center and acting as a hub for larger domes surrounding it. Each of the large domes is several stories tall. One kilometer south of the city is the aluminum smelter and nuclear power facility. Smelting aluminium is another key aspect of the lunar outpost. While on earth, the vast majority of aluminum is smelted with the use of fossil fuels. In Artemis, a key breakthrough has been made to refine aluminum from the lunar regolith minerals without fossil fuels. Smelting aluminum requires vast amounts of electricity, and indeed in Artemis, the author makes sure to place the power reactors and smelting facilities close together. A by-product of the smelting operation is the production of Oxygen which is conveniently pipelined back to Artemis for the air system. Again I have to commend Andy Weir on his attention to detail. Usual aluminum smelting uses coke to pull the oxygen off of the aluminium oxides in the ore which in traditional smelting produces carbon monoxide and carbon dioxide by-products. A process avoiding the need for carbon (which is limited on the moon) would potentially create excess oxygen. On the moon an innovation like this would change the game. And this is central to a couple of plot points in the story. A key output from the Aluminum smelting is of course copious amounts of aluminum to work with. That makes it an easy material to consider for building the structures on the moon. The Artemis domes are designed with a clever double wall for extra protection against potential impact damage. This double walled structure maintains near atmospheric pressure in the gap between the walls. One of the benefits of this design is that leaks can be detected in either of those wall surfaces. If pressure drops it means the outer wall has been breached, if the inner wall is broken, then the pressure will rise, thus a simple pressure sensor can help find leaks. Additionally this would allow for construction and maintenance to happen on the exterior of the structures – replacing panels etc, without needing to do complicated processes to create pressurized bubbles to work in. Built on a geodesic structure, panels of the building have the option of swapping in glass panels in some cases to allow light in. 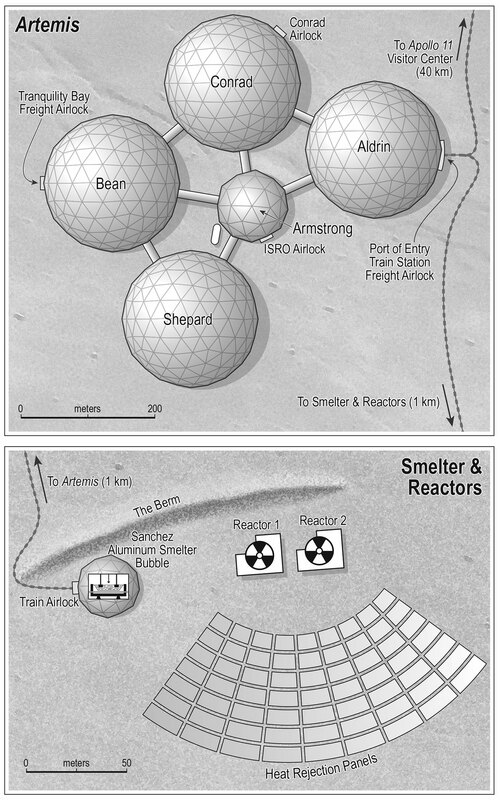 Domes offer quite good option for a building on the moon, easier access to the full height of the building, since climbing the walls is relatively easy. Geodesic domes have standardized components – joints and struts can be mass produced and so the vast amount of the structure consists of largely interchangeable pieces. Simple standard pieces would make construction easier to accomplish with robots able to climb and assemble the structures. Domes are also very good at distributing pressure evenly, which is why propane tanks don’t have square corners, the atmospheric pressure inside the domes needs to be held back from the vacuum of space. The economy of Artemis is described in depth and helps to understand the motivation of the plot. Aluminium smelting was operated on a break even basis under the stipulation that they produced the oxygen needed by the city. This was an acceptable investment by the owners of the smelter, because they are the russian mob, and are using the aluminum smelter to launder money. The book proposes that a development in space based materials – in this case advanced fibre optic cables, has the potential to diversify the entire lunar economy away from tourism and to something far more lucrative. In the real world, the new discovery of improved optical fibre is quite interesting and makes the book seem prescient in light of the plan to launch experimental fibre optic on the ISS this year.. Space based materials processing has enormous potential to provide real business reasons to expand into space. Fibre optic production is quite attractive, but other materials such as metal foams, or forming large crystals are intriguing areas of material science not yet fully explored. So this is a plausible storyline for Artemis. Better fibre optics would allow for fewer repeaters and thus lower costs for terrestrial telecom companies. the entire communications network would benefit from it. This is a pivotal moment of history for the lunar city, opening up the market for something beyond tourism and is the underlying motivation of conflict in the story. One of the interesting details that left a lasting impression on me with the book was the attention to detail about welding and heat dissipation in space. Jazz, the protagonist in the book is the daughter of a welder at Artemis, she grew up learning the craft. There are several descriptions of welding that made me think “Ah, I never thought of that” which I really enjoy. For instance, the lack of atmosphere does help with eliminating the need for welders to use argon to prevent oxidation while welding – a benefit, but without atmosphere there is also nothing to spark across – a spark is electricity travelling through air causing it to turn into a plasma – no air, no arc. Things you don’t always think about. Along the lines of heat dissipation, Andy Weir describes the robot vehicles used to dig up and bring regolith to the aluminum smelter using an interesting approach to deal with the heat generated by motors and gears. In a normal car you have a coolant system and radiator to transfer engine heat to the atmosphere. And Again no air on the moon means we need to have another way to get rid of the heat. The vehicles use an internal volume of wax, the wax melts and heats up as the vehicle drives around, before overheating the vehicle returns and can swap out the hot wax with cold wax. The setting and attention to technical details are what makes Artemis an interesting story to read. It reminds me of a quote I heard recently by Walt Disney who said “I would rather entertain and hope that people learned something than educate people and hope they were entertained.” Artemis uses story, humour, and narrative in a way to make the physics and chemistry memorable.